This summer, the Raiders’ quarterback job has been Matt Flynn’s to lose. So did he lose it Friday night? Or, was it just that Terrelle Pryor may have taken it away from him in Oakland’s 34-26 exhibition loss to the Chicago Bears? Flynn, who started Friday night’s game, was bad. He completed just 3-of-6 passes for a paltry 19 yards and nearly completed as many passes to Bears defenders, throwing two interceptions in his brief stint until Pryor took over early in the second quarter. At that point, the Bears were up 24-0 and Raiders fans weren’t happy. After Flynn’s second interception, thrown behind Jacoby Ford with little zip on it, some in the crowd began chants of “Pryor.” And they got what they wanted. 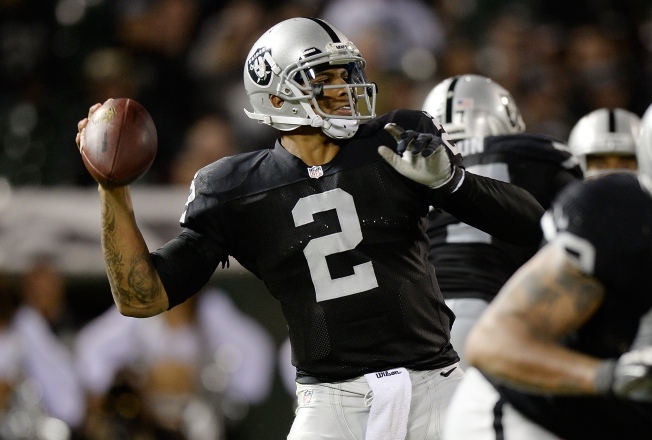 Pryor, showing a good arm and quick feet, completed 7-of-9 passes for 93 yards and a touchdown and ran four times for 37 yards – including a 25-yard burst for a touchdown – to lead the Raiders on four scoring drives from the second quarter through the third quarter (two TDs and two field goals). Though the Raiders didn’t win the game and still have a wealth of other problems to solve, at least Pryor gave fans something to cheer about and gave the Raiders decision-makers something to ponder. For Flynn, who went into last year’s training camp with the Seahawks as the anointed starter – then lost his job to rookie Russell Wilson – this must feel like a familiar scenario. That Pryor still may not be a polished NFL quarterback, but that his skill set at least gives the Raiders a chance to do something interesting when he’s taking snaps.